Owen Jones is a member of the ATOS, the Theatre Organ Society of Australia, the Walnut Hill VTPO and Theatre Organ SoundFonts groups on Yahoo!. We are proud to have him as one of our Featured Artists here at Walnut Hill Productions. 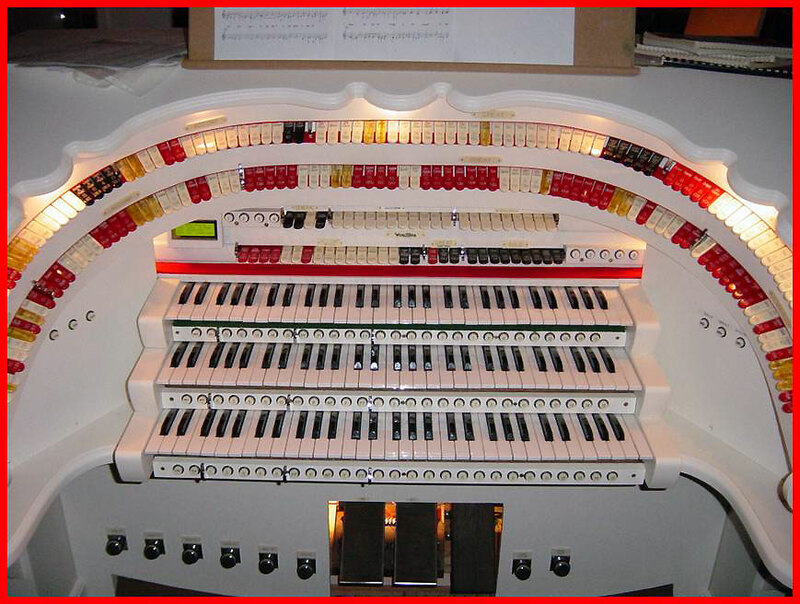 Please be sure to visit his website on The Theatre Organ Home Page to learn more about him and to download more pictures and great tunes from this wonderful fellow, one of the true pioneers in the Land of the King. Owen Jones is not only a glorious TPO player, he is also an engineering genius. Owen took his treasured Conn 651 analog electronic theatre organ and converted it to digital. 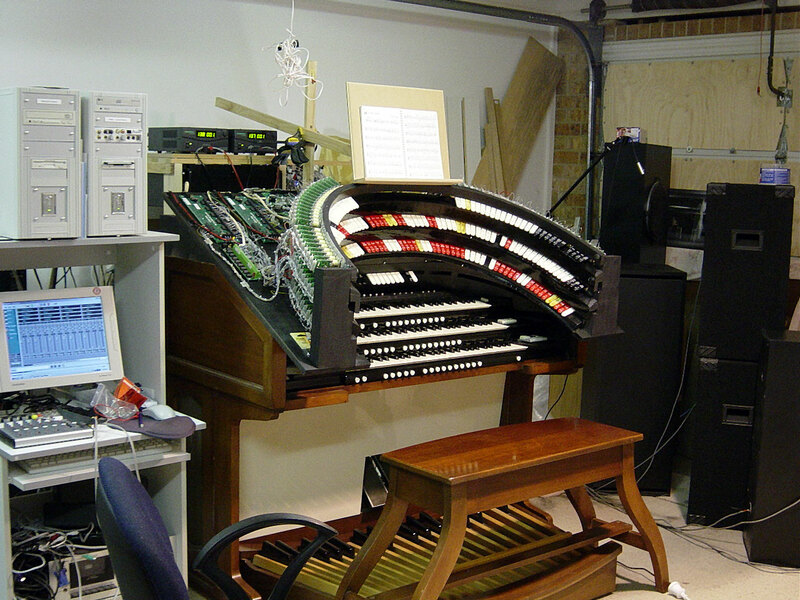 With 36 ranks of digital theatre organ pipe samples by Artisan, Moving Combination Action and full MIDI implementation, his is our first featured VTPO! 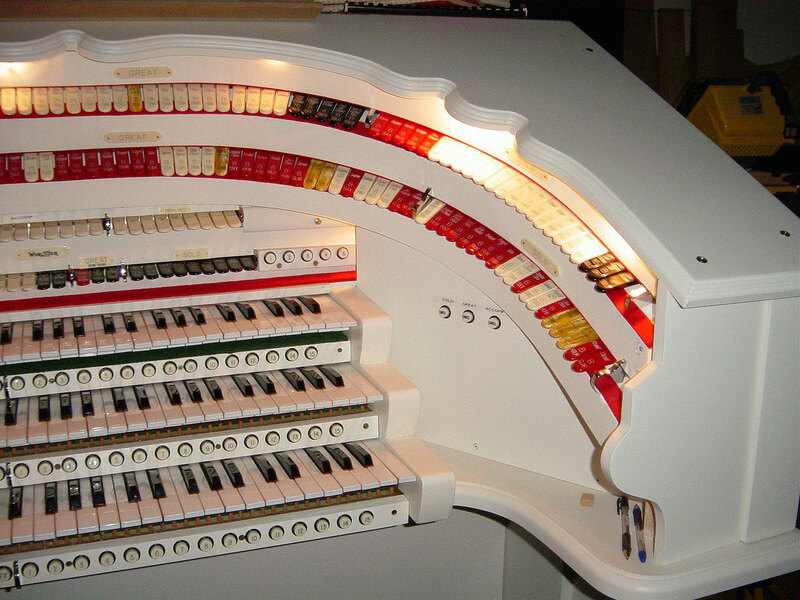 In the picture above, we see the console after conversion. The existing horseshoe was not big enough to hold all the stops, so Owen constructed a new bolster mounted on a board that rested on top of the existing horseshoe. The early days after the conversion, in Owen Jones's garage. It was not too long, however, that Owen discovered the converted console was only a stepping stone to much bigger things. So, he carefully removed all the retrofits and returned the console shell to its original form for someone else to use in a future project. 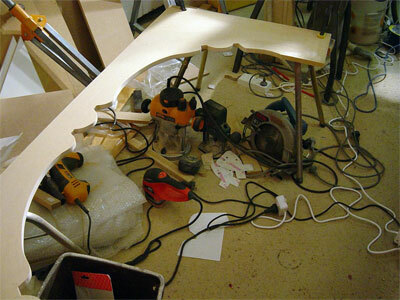 He then set about building a new, much larger console from scratch. The top board for the new console just after trimming. The first thing to do was construct the top board for the new stop rail and keydesk. 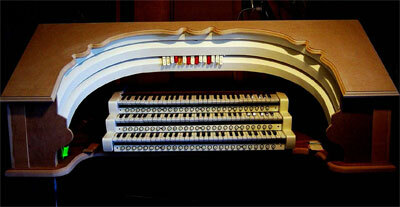 New bolsters had to be made that would put all those stops in a more traditional arrangement. This was no easy task. 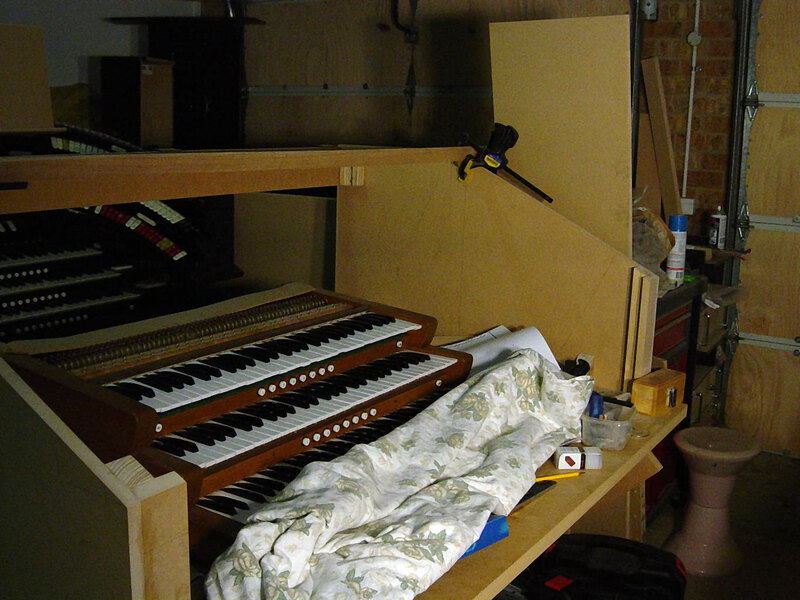 Here, we see the top board just prior to being routed along the scrolled edge to give it the look of a real WurliTzer Theatre Pipe Organ. The manuals being fitted into the new console. 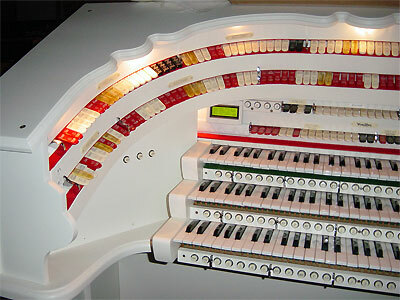 Dimensions were critical so that the keyboards would fit into the new console and have standard AGO dimensional placement. 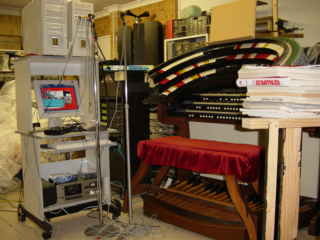 In the picture above, two manuals are being test fitted on the playing table. The new console prior to being painted. In the view above, we see the console shell nearing completion prior to receiving its first coat of paint. At this point, things did not seem quite right upon further examination of the dimensions. It was soon discovered that the stop bolster dimensions needed to be changed. So a new bolster was constructed to bring things more inline with actual AGO dimensions, seen in the picture above. The new bolster with the stops fitted. 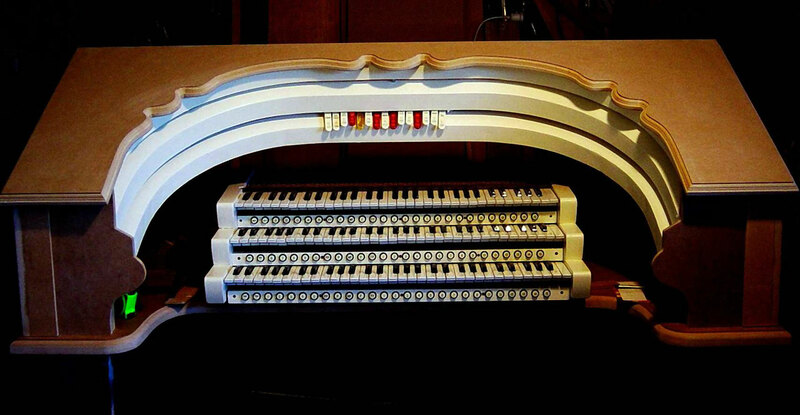 Here, the stops have been test fitted into the new bolster prior to being mounted into the console. The dimensions of the radius were altered a bit to accomodate all the stops, which would not fit in the first bolster constructed. 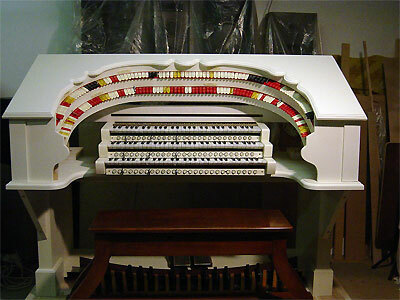 The horseshoe of the new console nearing completion. Here, we see the bolster mounted into the console proir to the addition of the multitude of syndynes for the moving combination action. Some of the stops have already been installed for a test fit. 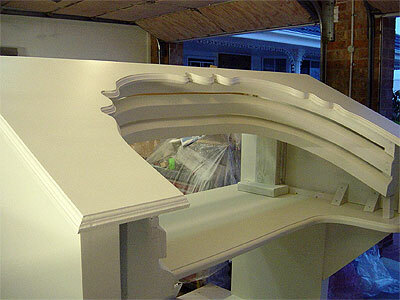 In the picture above, we see the stops mounted in the bolster after the console received a beautiful white finish. 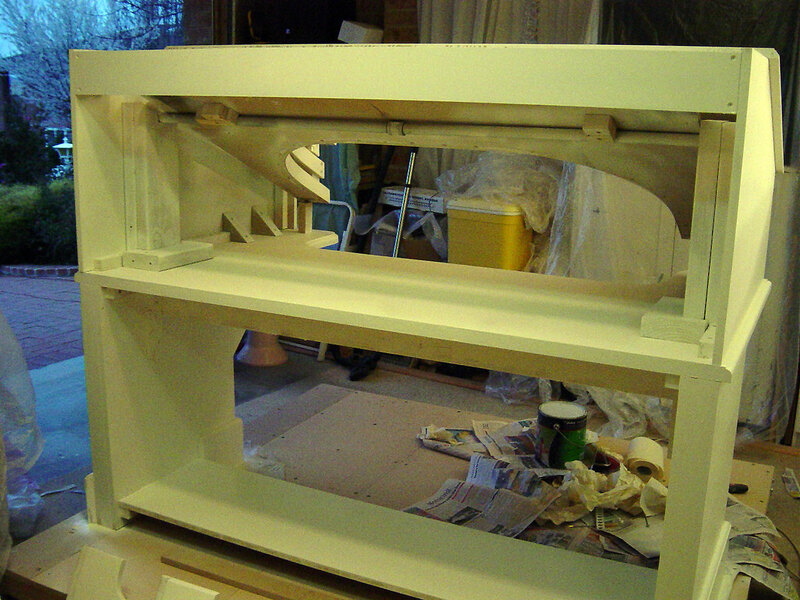 Note that the back rail stops have not been installed, and the bolster end panels have not been fitted. The keydesk of the new console nearing completion. 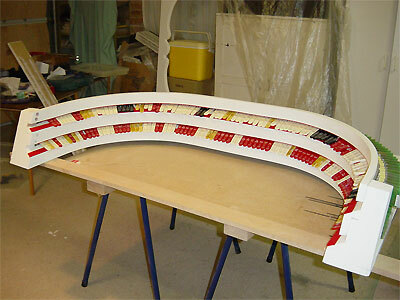 Here, we see the console as it nears completion, with most of the stops installed and the bolster end panels fitted. These panels would later get drilled for even more pistons, three on each side of the keydesk. After much hard work, the console is finally completed. 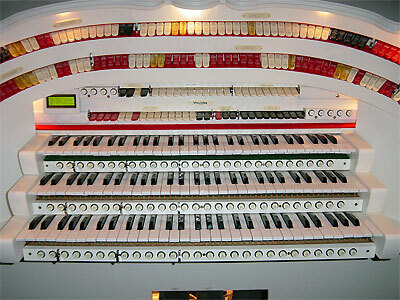 This is now a world-class instrument any organist would be proud to play. 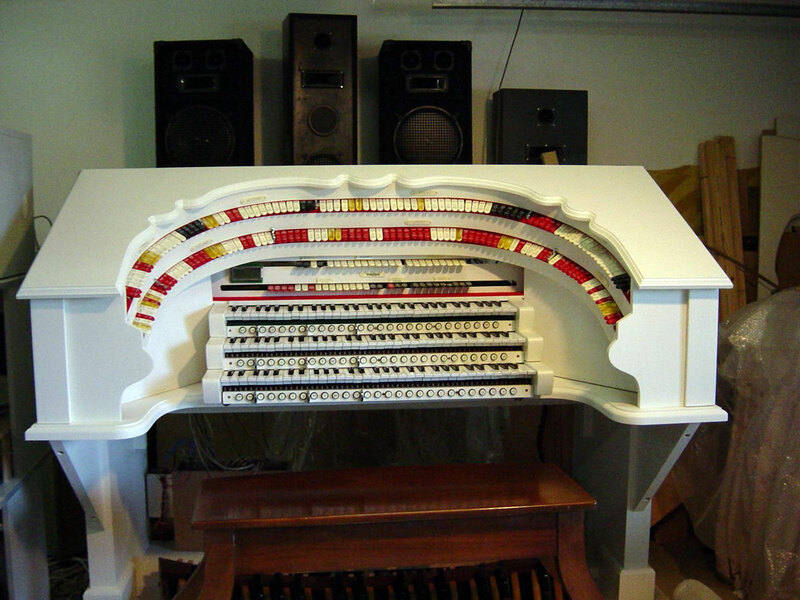 From what Owen has told us via emails, it is already attracting the attention of the local organ clubs in the area, as well as the Theatre Organ Society of Australia. 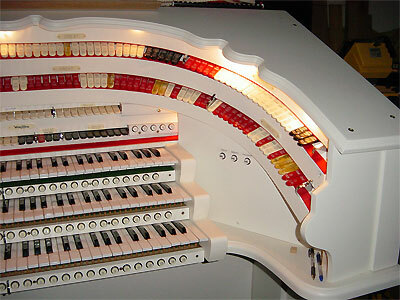 The keydesk of the new console after completion. In the picture above, we see the keydesk of the finished snow white double bolster three manual scroll top console, quite an awesome sight to behold, indeed. Now that the instrument is finished at last, we can give you an up close and personal look at the stop sweep bristling with 240 stop tongues controlling 36 ranks of Artsan samples that sound fringteningly like the real thing. 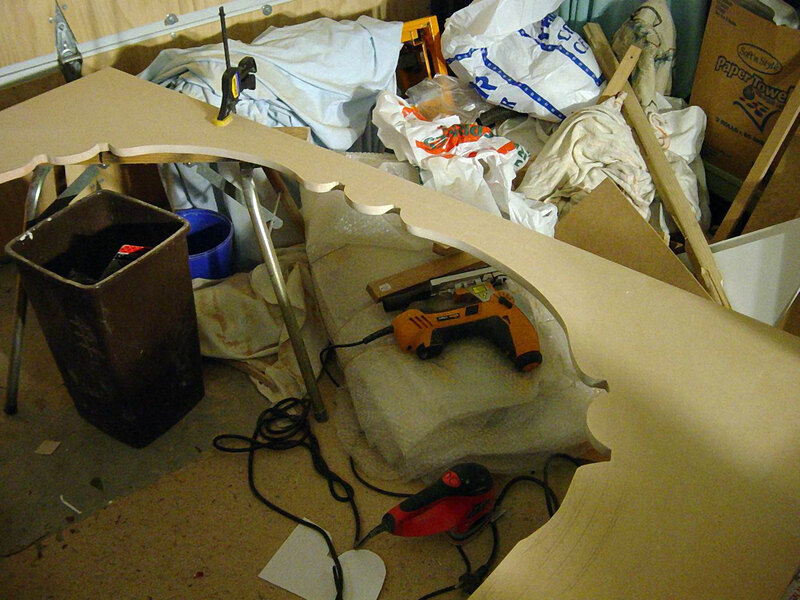 Looking to the left, we see the first curve of the horseshoe bolster containing the Pedal and Accompaniment stops. The back rail and fall board. 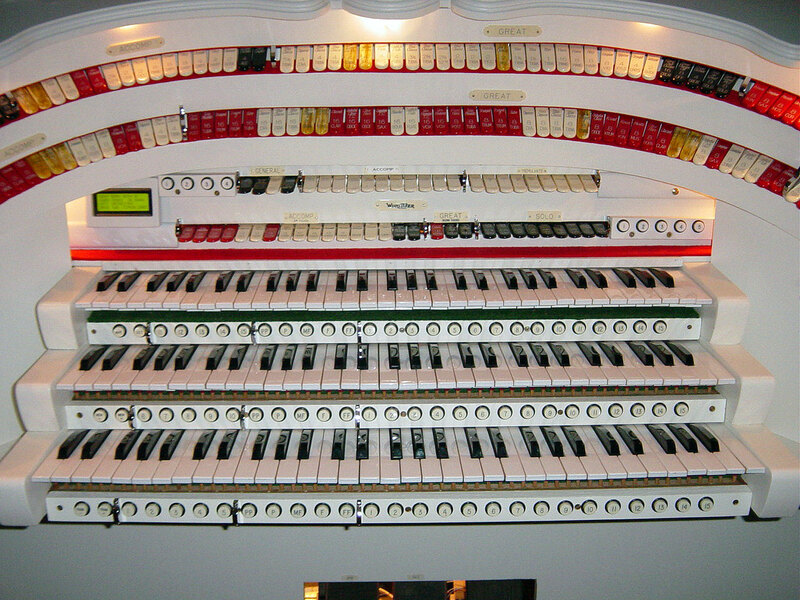 Looking toward the center of the console above the Solo manual, we see the back rail and fall board of this magnificent machine containing the Great stops and the Second Touches and Tremulants along with the General stops. Finaly, looking to the right, we see the second curve of the horseshoe bolster containing the rest of the Great and the Solo stops. General toe studs, swell shoes and crescendo pedal. 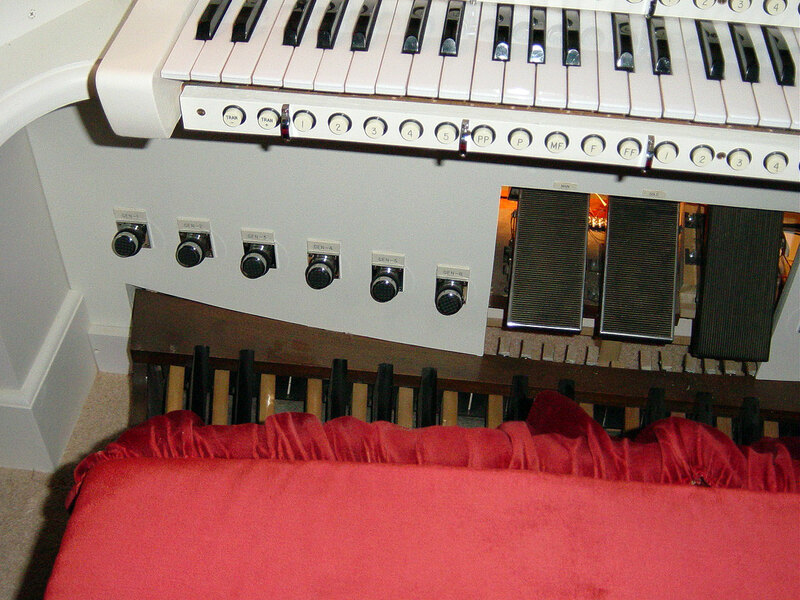 Below and to the left of the keydesk, we see the six General toe studs, the two swell shoes and the crescendo pedal. The piano sustain and cymbal crash toe studs. 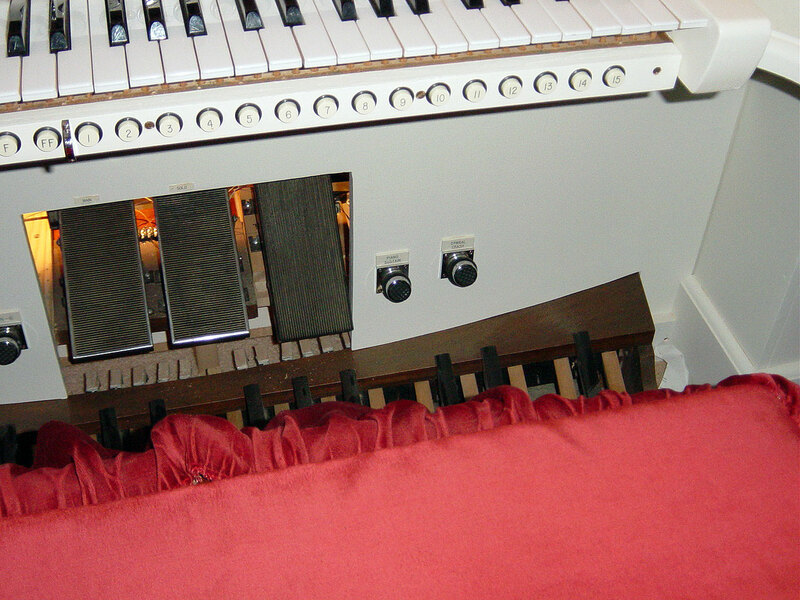 Below and to the right of the keydesk, we see the piano sustain and cymbal crash toe studs. 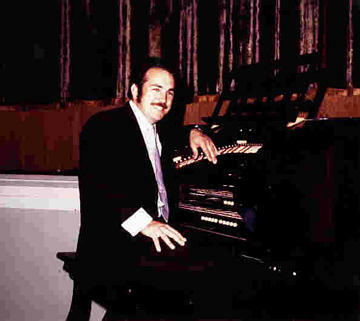 Below are some of the early recordings Owen Jone made on his converted Conn 651 theatre organ. Please be certain to visit his Music Downloads page often, as he is always adding more tunes! Playing time = 2:23, file size = 2.2MB, bit rate = 128KB/sec. Playing time = 3:43, file size = 3.9MB, bit rate = 128KB/sec. Playing time = 2:05, file size = 2.7MB, bit rate = 128KB/sec. Playing time = 2:32, file size = 2.4MB, bit rate = 128KB/sec.